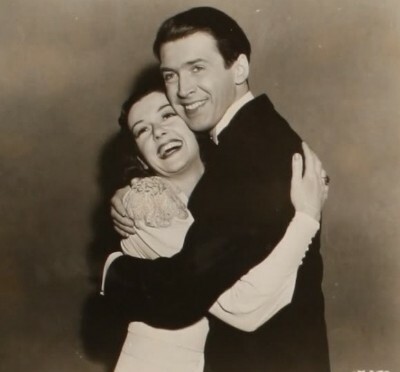 Around 1938, Rosalind Russell was teamed with James Stewart for a radio play, and although I am no biographer so I cannot confirm this, it is probably around this time that she befriended him. This cute couple were known to be dating on and off from around 1938 to early 1940. Rosalind met her future husband in late 1939, but she didn’t settle for one man right away. By 1940, she had fallen in love with Frederick Brisson and married him the following year. But her friendship with Jimmy Stewart persisted until her death in 1976. Although she did not marry Jimmy (she said in an interview later in life that they liked each other very much, but they just weren’t right for each other), I have always considered them an adorable couple. This is another great romantic pairing for Roz that only produced one film. The other one I’m speaking of is, of course, Cary Grant and His Girl Friday. And just like with Jimmy, Cary and Roz forged a very long friendship also lasting until her death. When Jimmy and Roz were put into No Time for Comedy (ridiculous renamed when it was re-released years later as Guy with a Grin), Rosalind had just come off of a phenomenally brilliant performance in His Girl Friday. She was on top of the world professionally and so was Stewart, who had given a talented performance in Mr. Smith Goes to Washington, which had been released the previous year. In comparison, No Time for Comedy is very weak in story, but I believe it makes up for it with those two sparkling, talented stars who share an amazing chemistry. They would both go on to make greater films, but we are lucky to have this one film so we can all watch them together. Rosalind Russell plays Linda Paige, a Broadway stage actress, and a successful one to boot. She is rehearsing a new play called Dilemma at Dinner, which was written by an unknown from Minnesota named Gaylord Esterbrook (what a name!). The new writer hasn’t arrived in New York City and the director bursting with bad attitude, Morgan Carrell (Allyn Joslyn), has little faith in the play, while the producer who is backing it, Richard Benson (Clarence Kolb), is about ready to give up on it. On the other hand, Linda finds it to be a brilliant play and wants them to give it a chance. It just needs a little touching up by the playwright… if he ever comes to town. When we first see this group of colorful characters, they stop into the local bar and order an aspirin, bi-carbonate, and Bromo (-Seltzer) when asked what they would like. With an order like that, it’s clear how well the play is progressing. Gaylord Esterbrook (herein called Gay, played by James Stewart) finally arrives in town when the cast is in the middle of a rehearsal. When he stops outside the theater and sees a poster promoting his play with his name in bold letters, he beams with pride. The stagehand tries not to let him in because being a small town boy from Redfield, Minnesota, he doesn’t look like the type who would write a play about some high class socialites who live on Park Avenue. Before he is finally let into the theater, we meet Clementine, another actress in the play and also a friend of Linda’s. The actress who plays this actress is Louise Beavers, who always plays fun, gregarious types. However, because she was African American and especially because of the time period, she was usually relegated to roles as maids or nannies (in this film as well), which is downright unfair and something that causes me anger. Who knows what amazing, inspiring characters she could have brought to the screen? She immediately has friction with the director, who always seems to be on edge. When they finally believe that Gay is who he says he is, he is let in and as Benson and Carrell go out, Morgan remarks, “What does he know about Park Avenue?” Benson responds, “Doesn’t mean a thing. I don’t know anything about Park Avenue, either, and I live on the darn street.” Inside the theater, Linda meets Gay for the first time, and assuming he is just some guy wanting to watch a rehearsal, she asks him to run out and get her a pack of cigarettes, handing him a quarter. He’s supposed to be watching the rehearsal and she thinks nothing of this until Benson and Carrell come back. She is introduced to Gay as the star of the play and he to her as the playwright. She is taken aback and asks for her quarter back, laughing. It is at this point that they shake hands and the viewer can size them up. It is ob vious what a good choice Jimmy is for Roz. It’s his sheet height that does that trick. Roz was tall (about 5’8”), so Jimmy’s 6 feet 3 inches definitely meant no awkward dance scenes or things of that nature. They have a wonderful rapport and you can tell right off they were friendly behind the scenes. They all sit down in the same row to watch the next scene. As they do, Gay stares at Linda without blinking. Sensing his stare, she looks at him out of the corner of her eye, turns to him, and smiles. As Benson lights her cigarette, Gay whispers to Carrell (but not out of earshot of Linda) “Is that really Linda Paige?” Carrell crosses his heart with his finger. “Cross my heart.” “For my money, she’s a little skinny to be a star.” Linda responds to this with a simple smile. They all agree to meet at Benson’s later for a meeting on the script and as they all start to go home, Linda notices Gay looking at a map. She offers to take him home, but he insists on taking the subway back to the Y because he longs for the city experience. Linda informs him that the subway at this house is “undeclared war,” but she offers to accompany him so she can “identify the body” after the subway dwellers gang up on him. Linda has immediately taken a liking to this country boy, and she is pleased when he walks on the outer part of the sidewalk in order to protect her from the danger of the street (Cue the ladies swooning). Gentlemen are few in the city and he is a rare breed. Later that night when Gay arrives at Benson’s for dinner, he is embarrassed to discover that all the men are dressed in tuxedoes while he is dressed plainly in a suit. He immediately runs back home to change into a tux. However, by the time he gets back to Benson’s apartment, the men have changed back into regular suits. During their discussion, Morgan vocalizes how much he hates the play, enlightening everyone, especially the author, with plenty of negative adjectives. Linda still really loves the play and convinces Benson to continue backing it. Linda and Gay have a discussion on the terrace about their backgrounds (Linda’s real name is not Paige but “Haggerty,” revealing her Irish roots). Gay sticks to the belief that people are pretty much the same all over, no matter how their lifestyles may differ. When Linda gives Gay his chocolate mousse, he doesn’t even recognize it, even though it is a dessert that is mentioned more than once in his play. Unfortunately, Benson decides not to produce the play after all because his butler doesn’t approve of the script. In the morning, Linda gathers all the actors together and they agree to waive their salaries for the first two weeks since the theater has already been paid for that allotted time anyway. The play opens and as both Gay and Carrell prepare for the controversial third act that Carrell hated so much, they drop in at the bar. When Gay sees Carrell order six scotches, all glasses set before him in a row, Gay decides to replicate that. “Give me six champagnes.” “What kind of champagne do you like?” “Uh, the type with bubbles.” Always that small town boy at heart without much world experience, he hadn’t mastered the art of drinking alcohol (he would show just how much he improved upon this later on). He emerges from the bar drunk and accidentally finds himself at the wrong play at the wrong theater. He sees Carrell outside and blames him for ruining his third act. He starts a brawl with him and they end up at the police station. After Linda gets them out, she and Gay wander over to Central Park and wait for the 5 am reviews. It is adorable as he stays up while she sleeps on his shoulder. “You don’t look bad at all for a girl who’s just getting up in the morning,” Gay quips. “Well, for a man who’s stayed up all night, you look great.” The newspapers start circulating. They discover they have received rave reviews for both acting (Linda) and writing (Gay). Gay then starts reading about what Linda did to save his play and he tenderly kisses her on the cheek to express his gratitude. Linda informs him she was about to “attack” him, too (as if a kiss on the cheek is an attack) and she asks him to marry her. “I don’t know whatever gave me the idea you’re skinny,” he says, and then kisses her. Before you know it, they are enjoying wedded bliss. But it doesn’t take long for problems to surface. Although as the time has passed, Linda has appeared in a string of successful comedies all written by Gay, he has found himself in a rut. And this isn’t the first time this has happened. He has developed a drinking problem (a far cry from the man he used to be) and goes on drinking binges when he is in between writing ideas. One night at a party, Gay and Linda meet Philo and Amanda Swift (Charlie Ruggles and Genevieve Tobin), a very strange couple indeed. Amanda flutters around the party until she finds a man in which she sees “possibilities” and encourages him until he has a swelled ego. Philo is very indifferent to his wife’s activities. He just goes back to his reading or his drink, not giving a damn either way. Amanda decides her new “project” will be Gay. She sees the unhappiness in him, but she knows she can fix that. The way she fixes her gaze on Gay is an immediate cause for trouble. I personally (and I hope I’m not alone in this) find Genevieve Tobin absolutely irritating in this film. It’s not just her character, but her whiny, high-pitched voice and the fact that her beauty is nothing compared to the beauty that Rosalind Russell possesses. So why would any man (even temporarily) drift to her instead? I suppose it might mainly be because of the lovely lies she tells him, but it is a bizarre situation nevertheless. Under Amanda’s guidance, Gay decides to steer away for comedies for which he is known for and sets his sights on a great drama. It is difficult for him and he doesn’t make much progress on it as time passes. He starts frequenting more and more of the local bars and Linda and Clementine (who is now her personal maid—yep!) have collected a long list of these bars’ numbers on their notepad. When Gay doesn’t come home, they can dial these numbers to try to find him. One day when Philo comes over to the Esterbrook residence, he lets Linda know that she will be able to find Gay at his house. He has been spending a lot of time with Amanda there. She is surprised at the news, but she acts like she’s fine with it, smiling her way out of it. After he leaves, Linda adds the Swift number to her pad of bars’ numbers. When Gay arrives home the next day, in spite of their recent troubles, it is still so obvious how much they love each other. A cute, charming moment occurs when Gay lies down on the couch with his head in Linda’s lap. Before he gets up, she ruffles his hair by running her fingers through it. Even though the scene ends with an argument about what Gay does with his time and Gay’s childish accusations against Linda, I love this scene anyway. Gay recognizes Amanda’s number on the pad and accuses Linda of spying on him and storms out of there. When Amanda runs from the room crying and Gay yells viciously at Linda for upsetting her, Linda is left alone with Philo. At first she seems to have her wits about her and in control of her emotions, but just like turning on a dime, Linda is suddenly hysterically sobbing about the predicament she’s found herself in. Even though he’s awkward and uncomfortable about it, Philo allows Linda to sob on his shoulder. She cries out to him: “I don’t want to lose him!” and how completely unrestrained her sobs are gives us a glimpse of what a great actress Roz is. It is with moments like these that we can see how realistic of an actress she can be. When Gay returns home, Linda acts like she hasn’t been worried about him at all. During this scene, when Gay asks Linda if she thinks Amanda is an idiot and Linda replies, “I think she’s a clever idiot, but an idiot nevertheless,” I always think of the blooper Roz made when filming this scene. As part of their Breakdowns of *insert year here* series, Warner Bros. included Jimmy and Roz in 1940. Roz flubs her lines and says, “I think she’s a clever idiot, but an idiot never the same. I mean…” I just love stuff like that! “You can preen yourself. You can revel in your own superiority. You’re self-sufficient. You don’t need anybody but your press agent. And then you can turn and gaze at yourself in a full-length mirror!” Her feelings hurt, she tells him to stop saying those things and asks him to leave, tears stinging her eyes. Before we all know it, Gay has finished his tragic drama and it is about to open on Broadway. Linda and Philo attend the play. Linda knows how talented Gay is, and even though many of the patrons laugh during his drama, Linda feels deeply for the play, especially for its writing. Before the third act starts, Philo is ready to leave because Gay has clearly failed. Assuming Linda will go with him, she surprises him by staying for the remainder of the play. Amanda has already set her sights on Morgan in whom she sees “latent possibilities.” The theater empties very quickly and the only two people left in the theater are Gay and Linda. She starts applauding him loudly and yelling “Author! Author! Speech! Speech!” with tears filling her eyes. He delivers a beautiful but sad speech about what has become of him and his admitted failure with this play. It is quite reminiscent of his moving speech delivery in Mr. Smith Goes to Washington. He is a truly gifted actor. Linda, who is indeed very moved, runs toward him, telling him of her idea for a new comedy he should write (with her as the star, of course). She looks around the theater and remarks, “Gosh, all those seats,” which is a throwback to the moment when they first met. He starts to go out to get her a pack of cigarettes when she touches his hand. He gazes down at her and says, “Gosh, I haven’t kissed you for two months.” “That’s nothing to brag about, you long drink of water.” The movie fades out, ending as we wanted and expected it to.